Like many others, I have a very high opinion of Horenstein's 1970 live recording of Bruckner 8 with the LSO. This recording has been available until now on M&A, Descant and Intaglio, which may or may not be exactly the same transfer -- I have the Intaglio. Now the BBC has given this performance an official release, with a new mastering from their own master tape. I've always been pretty happy with the sound on my Intaglio copy, but I wanted to know whether the BBC was a significant improvement. Imagine my dismay when two authoritative voices -- Henry Fogel and Tony Duggan -- came down on different sides of this question. Tony found the improvement slight, Henry found it more important. The difference left me no choice but to fire off an order to MDT for the new BBC release, so I could hear for myself. Listening confirmed that the BBC release sounds better -- the sound has more "air" and immediacy than the Intaglio, which sounds slightly muffled in comparison. Henry felt that the BBC sound was more extended at both high and low frequencies than the earlier release. To analyze the differences more closely, I copied pieces of each recording into the computer and used a couple of different techniques to analyze them. Examining the spectral content of the Intaglio immediately reveals its origin as an off-the-air taping -- the spectrum is sharply cut off at 15 kHz, and significant traces of the 19 kHz subcarrier are evident. There is also a gradual tailing off of high frequencies from about 10 kHz. The BBC shows no such anomalies at high frequency, with the response extending smoothly to at least 18 kHz. There was no significant difference in the low-frequency response of the two transfers, or in their overall frequency balance below about 10 kHz. Though the off-air origin of the Intaglio is clear, the taping was clearly done very carefully and on high-quality equipment; there is no significant compression of peak responses compared to the BBC, and very little if any audible extra distortion. The slight attenuation of high frequencies accounts for the relative (slight) dullness of sound on the Intaglio. Since the Intaglio came off the air, it was possible that extra dynamic range compression (applied at the time of transmission) would be evident. In fact, there is none detectable -- both the BBC and the Intaglio have the same dynamic contours, which reflect the careful use of a moderate amount of dynamic range compression at the time of original recording. There is no sign that the BBC issue was Cedared or otherwise denoised. Both recordings have roughly the same signal-to-noise ratio, which is reasonably good but which lets through some tape hiss. So where do I come out? The BBC certainly sounds better, and as Henry mentioned the effect seems to be cumulative over long listening. On the other hand, the Intaglio remains perfectly satisfying and no one should buy the BBC issue in the hope of major sonic improvement. 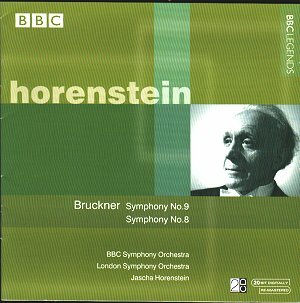 I have now compared the Bruckner 9th (BBCSO, live 1970) that is coupled with the 8th on the BBC issue with the Intaglio issue of the same performance. The difference is substantially greater than in the case of the 8th. The BBC issue of the 9th has sound of similar quality to that of the 8th, but analysis of the Intaglio reveals a number of significant defects that contribute to "grittiness". Like the 8th, Intaglio's 9th is derived from an off-the-air tape -- the recording is sharply low-pass filtered just above 15 kHz, and shows detectable amounts of the 19 kHz pilot signal. Unlike the tape of the 8th, however, the tape of the 9th is somewhat overmodulated at the peaks. This reveals itself in a detectable compression of the loudest peaks, combined with the appearance at those points of significant energy in the 15-20 kHz range which I take to be harmonic distortion due to tape overload. Perhaps because of the overload, the high frequency content of the Intaglio is somewhat attenuated compared to the BBC, with the level down about 3 dB between 2 and 5 kHz, and almost 5 dB at 10 kHz. As a result, the BBC sound has substantially more "air" than the Intaglio. There is an additional problem with the Intaglio -- very low frequencies are quite substantially attenuated, by 4.5 dB at 80 Hz and 7 dB at 40 Hz. This is, I think, the result of an effort to remove significant amounts of 50 Hz hum from the original recording; the hum is still detectable in a spectrum analysis and sometimes audible during quiet passages. The overall effect of these defects is to make the sound on the Intaglio substantially inferior to that on the BBC. In addition to the grittiness (presumably due to distortion), the lack of deep bass is quite noticeable when the two are compared. While my earlier comparison of the 8ths suggested that the Intaglio would be entirely satisfactory for most listeners, those who care about sound will certainly notice a difference between the 9ths. Some who greatly admire the 8th find the 9th less satisfactory as a performance (eg Tony Duggan), but others (eg Henry Fogel and me) find it very nearly as impressive. If you are in this camp, you may well find the BBC issue worth buying for the substantially improved sound of the 9th. Setting aside the technical aspects of different tape sources for a moment, it is worth noting that the basic sound of the recording of the Bruckner 8th (made in the Albert Hall) is more spacious and better blended than that of the 9th (made in the Royal Festival Hall. Even with the sonic improvements noted in the BBC issue, the recording is really not all that good -- it is too closely miked for my taste and tends to sound a little harsh. So if you elect to buy the BBC issue in the hope that the engineers managed to "fix" the basic sound of the RFH, prepare to be a little disappointed.